Lasius niger the Black Garden Ant is the most common ant here in the Uk. They are often found foraging around our gardens and patios, and all too often coming into our homes looking for tasty treats. There is a common misconception that 'flying ants' are a different species, these winged ants are merely the colonies fertile queens and males which leave the nest on mass (usually on a barmy day in summer) to take to the wing and reproduce. Garden ants are a pest, yes you can be bitten by them but asides from a light sting they pose no real threats to us humans. They do however enter homes, swarming on some occasions. They are notorius for turning up inside food packaging which results in wastage. In the garden they will harvest aphids for the honeydew they produce. This can lead to extensive aphid damge to plants and ants will also attack and eat fruit still on the plants. Ants are more of a nuisance than a pest in most circumstances and can cause alarm if they should swarm inside your kitchen, however the risks to us are minimal. Treatments for Garden Ants vary according to circumstance. A common treatment is a barrier spray, which is a highly residual insecticide sprayed around the perimeter of an affected area (your home) which then creates a lethal barrier should any ants try and cross. As effective as its is the residual effects will wear off over a period of time (maybe two months depending upon environmental factors) and it does not get at the root cause of the problem. New insecticidal ant baits are available which deal a direct blow to the colony at its heart. Baits are picked up by foraging workers and taken back to the nest. The beauty of this is that on returning to the nest the workers then feed poison to the queen, larva and other workers. As ants follow pheromone trails they will systimactically walk onto the bait (providing it is placed in the correct place!) and also let other know where to find it. Domestic products are available, however through experience we suggest you avoid anything you can buy online or at a garden centre. Destruction of the colony usually happens over a two week period but results become noticiable within a few days of treating. The lifecycle of Lasius niger begins as an egg in the nest. The eggs themselves look like small rice crispies and are well looked after in the nests brood chambers. 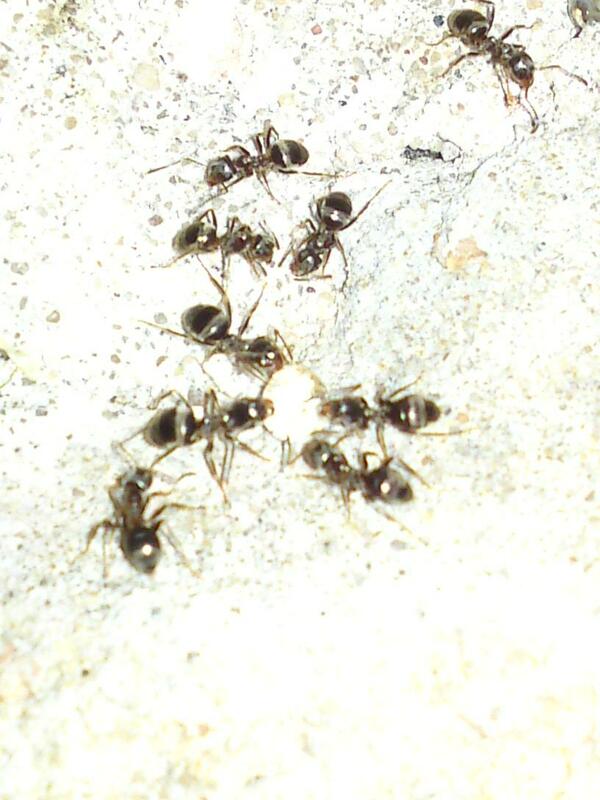 If you have ever disturbed an ant colony you may well have seen worker ants trying to evacuate these precious eggs. On hatching the second stage of the Ant lifecycle is one of a larvae where it will undergo three molts before entering the cocoon stage (pupae) before metamorphasises into an adult - either a worker, male or queen. On warm days with good humidity the males and fertile queens leave the nest on mass, their goal is to take to the wing and reproduce. The males will die shortly after mating, the young queens will however fly off to create new colonies close by. The now fertilised queens will lose their wings shortly after landing aomewhere and selecting a new site for a colony.